Amateur paleontologist Ray has been collecting loose track slabs in streams in and around Washington, D.C. since 1992, amassing what may be the world's largest and most diverse collection of Lower Cretaceous tracks (approx. 115 million years old). While visiting Ray in 2000, I was amazed at the scores of tracks that he had already collected, representing several types of Mesozoic animals. 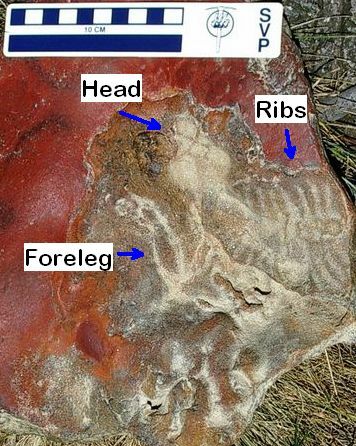 These include footprints of various theropods (bipedal meat-eating dinosaurs), ornithopods (bipedal plant-eating dinosaurs), plus rare tracks (some never found before in the eastern US), of juvenile sauropods ("brontosaurs"), pterosaurs (flying reptiles), hypsilodontids, nodosaurs (tank-like dinosaurs such as Ankylosaurus, sporting heavy plates and spikes), and even early mammals. Ray seems to have a special eye for spotting small and rare specimens. He has found the smallest dinosaur tracks ever reported (only 9 mm; approx. 3/8 inch long), and while traveling in Texas, found the only known hatchling sauropod tracks (with rear prints only about 2 inches long-compared to adult tracks that are often over a yard long). Another juvenile sauropod track he and his wife found in four pieces over multiple trips to a MD creek, and many yards apart, but they fit together perfectly. Ray also discovered the only baby anylosaur ever found -a natural cast showing the head, arms, and ribs. This unique find was declared a new species: Propanoplosaurus marylandicus, and put on display at the Smithsonian, where Ray plans to donate his entire collection. As fabulous as these finds were, none compare to his 2012 discovery of an approx. 8 x 3 ft track slab, which is being hailed as one of the most important fossil finds of all time, and which came about through some odd coincidences. Ray first noticed a small patch of the rock poking through the grass near a parking lot at the NASA Goddard Space Center near Wash DC, while dropping off his wife Sheila, who works there. Upon brushing off the small exposure, Ray realized that it was a nodosaur track. This alone was a wonderful find, since nodosaur tracks are rare. It was also found in the nick of time, since within days NASA was planning to plow the area over in preparation for construction of a new building. After realizing the importance of the find, NASA decided to postpone the construction project and contract for the rest of the slab to be exposed, excavated, molded, and removed. During these activities, from which Ray was largely excluded, only one other large track (a sauropod front print) was noticed on the slab. subtle tracks occur on the slab than are shown on the diagram. Fortunately, a cast of the slab was delivered to Ray's home for his study. As Ray examined it under angled lights, and gently sloshed onto it a solution of light-colored sediment to highlight its contours, he and Sheila began to spot more and more tracks and unusual features. 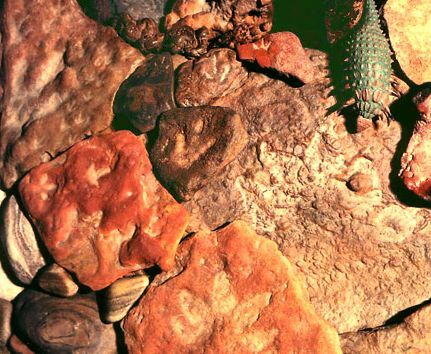 Before long, they had recognized almost 70 tracks of at least eight different animals. These included baby nodosaur prints alongside the original large one, several small theropods trails taking very short steps (some with heel impressions), some bird-like tracks, pterosaur prints (wing, foot, and beak marks), three sizes and types of early mammal tracks (the most ever found on one surface--including the largest Cretaceous mammal track ever found), a sauropod front foot track, a possible crocodile track, plus a nodosaur scute, coprolites, and invertebrates (apparent insect larva). Many of these features appear to suggest interesting behaviors and interactions, such as a baby nodosaur walking with a parent, a group of theropods moving very slowly and in the same direction (possibly stalking the smaller mammals or avoiding the larger ones), and pterosaurs stabbing at insect larva, and hopping mammals. In short, the find exhibits an almost unimaginable variety and density of tracks and behaviors on one relatively small slab, inspiring track expert Martin Lockley to call it the "Rosetta Stone of Cretaceous tracks." Ray himself calls it a virtual "time machine." The find has been featured in many news stories, and was described in the prestigious science journal Nature, with Ray and Lockley as lead authors. The original slab has been moved to an undisclosed location, but the finished cast is now on display at NASA Goddard, where a grand-opening celebration was attended by many scientists and government dignitaries. I am trying to arrange a club field trip to see the Ray's finds, and am pleased to report that Ray has offered to give us a personal tour and talk. The mind boggles at what might exist on even larger exposures of the track bed, which evidently once existed on the NASA properly. Sadly, except for a few small pieces, all other remains of the bed were long ago plowed up and dumped (or buried?) in unknown locations. Also unfortunate, the streams and creeks where Ray did most of his collecting have been covered over with concrete or gravel in the name of "flood control," even though this ended up only making flooding worse, while ruining the collecting and natural beauty of the streams, and wasting millions of tax dollars. Some interesting comparisons and contrasts can be made between the Goddard slab and the Lower Cretaceous tracks I have been studying for many years in Texas, especially in and around Dinosaur Valley State Park near Glen Rose, Texas. Like the Goddard slab, many of the Texas sites show a remarkable variety and density of tracks. These include many striding trails of theropod and sauropod tracks, as well as elongate, heel-impressed tracks (once mistaken by some for "human" prints) apparently made by slender ornithomimid or "ostrich mimic" dinosaurs, a few ornithopod (bipedal, plant-eating dinosaur) trackways, plus various invertebrate markings and problematic traces, including large double-gouge marks, "swishes" and "squiggles" of uncertain origin. However, so far the Texas sites have not yielded any pterosaur or mammal tracks, and despite being almost the same age as the MD tracks, the Texas sites and individual tracks are typically orders of magnitude larger. Some of the TX sites cover areas larger than a football field, and even the smallest tracks on them are much larger than most MD tracks. 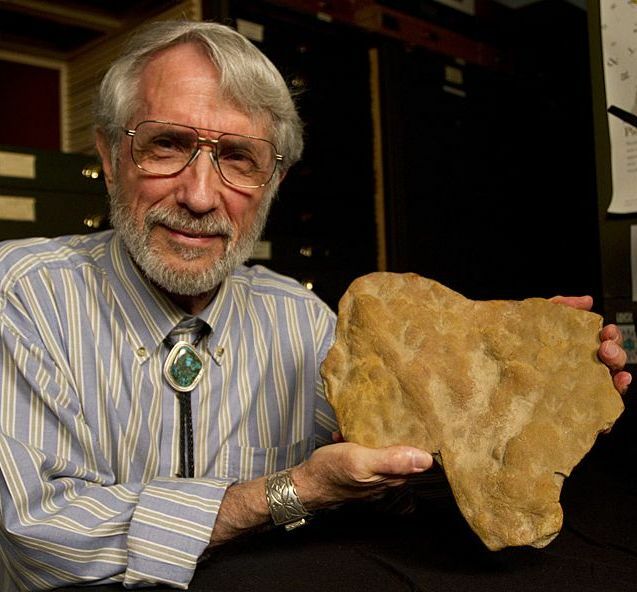 A typical Texas sauropod footprint set (rear and front print) is almost the size of the entire Goddard slab. These astounding size differences may reflect differences in the average sizes (or growth stages) of the animals visiting each area, as well as preservational biases due to different substrates and environmental conditions. The MD beds are organic-rich ironstones, apparently formed on ancient river deltas, whereas the Texas track beds are mainly limestones, formed on vast mud-flats near a large, shallow sea.